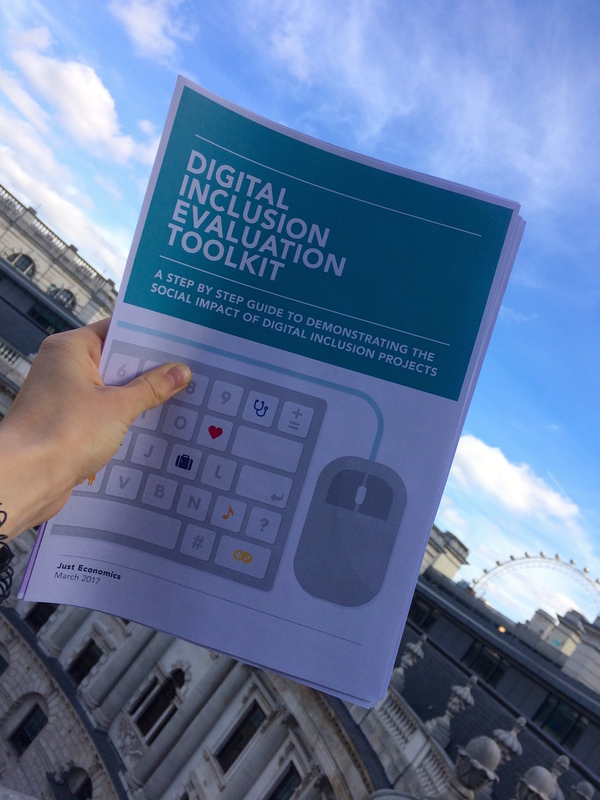 In 2015 we published a digital inclusion evaluation toolkit (“Evaluate IT”). Since then, the team has worked with members of the Digital Inclusion Research and Evaluation Working Group, organisations in local government, the charity sector and housing associations, to test and improve our first iteration. We have now published the new resource on GOV.UK. You can find it here. Perhaps the most noticeable change at first glance is the name. All the documents now come under the heading Digital Inclusion Evaluation Toolkit. We thought the title should pass the ‘does what it says on the tin’ test. We’ve made it more ‘lite’. The Toolkit is now broken into more manageable chunks, with a main toolkit accompanied by separate optional guides on stakeholder engagement (focuses on more qualitative techniques), outcomes and indicators, as well as templates for surveys and report writing. A short overview document highlights the key processes for good evaluation. We’ve included a glossary and definitions. You should not now need to look far for explanations of more complex terminology and methodology. We’ve made a flowchart to explain the process ‘at a glance’. This is in the overview document, and will provide a brief/checklist reminding you what to do next. We’ve got rid of the hard stuff. Some parts of the previous toolkit were, in practice, difficult and not really necessary. The new Toolkit has shed these sections, but will still allow you to complete an excellent and robust evaluation. The Toolkit is there for EVERYONE trying to increase digital inclusion to use. It’s for small or large organisations, with expert or beginner evaluation experience and with specific digital inclusion focus, or wider evaluation needs. Being part of the pilot project has given Norwich City Council a chance to really consider the learners’ journey and make sure that we are achieving the best customer service possible. The evaluation has given a focus to our employees and volunteers, as well as the opportunity to meet the other pilot group partners and learn from their wealth of knowledge. Thanks for inviting us to take part! Once you've tried using the Toolkit, we'd love to hear what you think. Let us know at digital-skills-and-inclusion@culture.gov.uk. And don’t forget to spread the word, and encourage other people and organisations to use this Toolkit.